Basic human needs are independent of the building type, but the way ventilation is used to meet those needs can depend on the building type. This is discussed in the following sections. Renovation of existing residential buildings can be performed at different levels. More extensive renovation, which can include additional insulation, replacement of all windows in the house, improved airtightness and more. Many house owners are interested in improving energy performance as part of the renovation. This can have consequences for the ventilation of the house and, therefore, on the indoor air quality. By improving airtightness and replacing old windows with new windows, the unintended infiltration is reduced. This requires that other measures be taken to ensure adequate ventilation. The right ventilation depends on the type of room. Most existing residential buildings use natural ventilation, and the following is based on that assumption. Bedrooms are characterised by being a relatively small rooms where people spend a long time, typically 6 to 8 hours per 24-hour period. The bedroom is the room where we spend the most time during our lives. It is very important for our health to ensure adequate ventilation of bedrooms. Many residential buildings have insufficient ventilation of bedrooms even before they are renovated. To ensure adequate ventilation by natural ventilation, at least two windows should be installed. The windows should have ventilation flaps or grilles that can be opened during the night for as much of the year as possible. Windows at two different heights in the room will perform much better than two windows at the same height; they enable the stack effect to work. However, ventilation flaps alone will not always be sufficient to ensure adequate air quality in a bedroom. Electrically operated windows (VELUX INTEGRA®) provide much better opportunities than manually operated windows, as they can be programmed to make one or two airings during the night. Decentralised, mechanical ventilation can be considered. The ventilation rate of the bedroom during the night is higher when the bedroom door is open. A study of ventilation rates in typical houses showed the following ventilation rates for different door positions. Closed door: 0.3 ACH; Door ajar: 0.4 ACH; Door open: 0.5 ACH (Bekö et al., 2011). The use of a children’s room depends greatly on the age of the child, and whether it is used for sleeping only or also for homework, play or entertainment during the day. There are often many toys and electronic appliances in this room, which increases the need for ventilation due to emissions. But children are often unaware of the importance of ventilation. The considerations that are given for bedrooms also apply to children’s rooms, but with the additional emphasis on high airings discipline – which many families with children do not have time for. So electrically operated products are particularly relevant in this room. Living and dining rooms typically have more floor area per person than bedrooms, and we spend less time in living rooms than in bedrooms. This makes it easier to provide adequate ventilation of living rooms. The ventilation must often meet comfort requirements (feeling of fresh air) rather than health requirements. The need for ventilation in a living room can change from low to very high (with guests in the house), and the ventilation design must reflect that. A flexible ventilation design includes two to three operable facade windows and a similar number of roof windows to allow efficient airings when the need is high. Manually operated windows may be sufficient if ventilation flaps are used in combination with a reasonable use of airings. Electrically operated windows can provide additional peace of mind. Activities in the kitchen generate humidity, smell and fine particles, all of which are most effectively removed by efficient ventilation at the time of the activity. Cooking hoods are important, but their performance is reduced as they get dirty from grease, and airings while cooking is a good habit and an efficient supplement. The airings are most efficient when windows located at two different heights can be opened, e.g. facade windows and roof windows. Due to the heat generated by ovens and stoves, cold draughts are rarely a problem in kitchens. As the need for ventilation is usually easy to sense and smell, it is simple for occupants to make airings at the right time. Humidity-controlled electrically operated windows can be an additional benefit. Bathroom activities produce humidity and smells. umidity generation is high during baths, but bathrooms are not used much during a 24-hour cycle. An efficient ventilation design, therefore, allows high ventilation rates for short periods. Bathrooms are often equipped with mechanical extract ventilation, but good possibilities for airings are an advantage. The most efficient airings are achieved with windows at two different heights. As the need for ventilation is usually easy to sense and smell, it is simple for occupants to make airings at the right time. Humidity-controlled electrically operated windows can be an additional benefit. In houses with natural ventilation, it is important to consider the flow path of the air in the house when it is renovated. The flow path depends greatly on wind direction, wind speed and external temperature conditions, and a specific window can function both as inlet and extract. However, high-placed windows (and stack ducts) will function mainly as extracts. In one-storey houses, roof windows in kitchens and bathrooms will often function as extracts and will ensure that air is generally taken into the house through bedrooms and living rooms and extracted through wet rooms. In two-storey houses, windows at the upper level will often function as extracts. If bedrooms are located on the upper floor, it is important that bedroom windows are not used as extracts, as this may cause overheating and will increase the risk that the air entering the bedroom is from other rooms in the house and therefore less fresh. An efficient solution is to place a roof window above the staircase on the upper floor, as this window will often function as an extract for the lower level. The choice of ventilation system in new residential buildings is often heavily influenced by energy legislation and by the energy performance ambitions of the future houseowner. In Northern European countries, mechanical ventilation with heat recovery is becoming a de facto standard, thanks to its ability to reduce heating demand during winter. Natural ventilation remains the most energy-efficient ventilation system during summer in all European countries, as there is no heat loss and no demand for electricity to drive fans. In new residential buildings, both mechanical and natural ventilation can meet legislative and performance requirements. Natural ventilation can be the primary mode of ventilation or a supplement to mechanical ventilation. Many of the considerations on renovation of existing buildings discussed in the previous section 2.6.1 also apply to new buildings. The indoor air quality of the bedrooms in Maison air et Lumière has been evaluated for night hours only, in this case shown below where CO2 levels are generally lower in summer than in winter. Category 2 is mostly achieved for the majority of the months, although June has elevated CO2 levels. Overall results show that demand-controlled natural ventilation using VELUX Integra® roof windows can create satisfactory indoor air quality in bedrooms during night (Plesner et al., 2014). 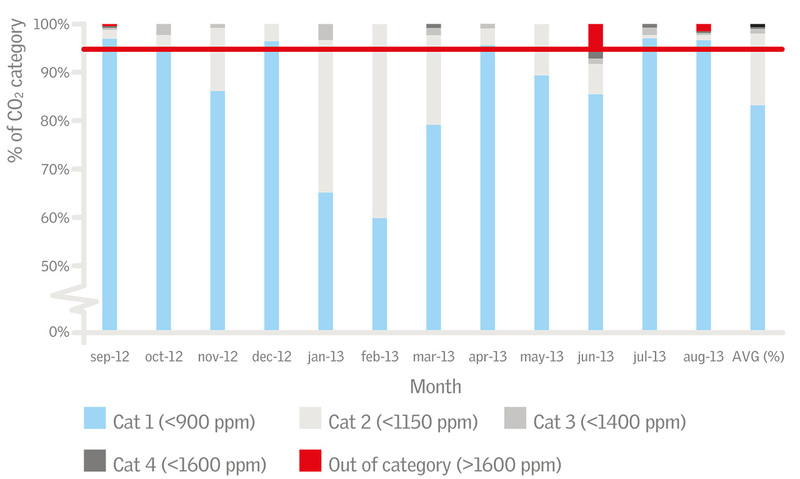 Figure 2.6.1 Monthly CO2 levels for bedroom B (1st floor) for night hours in Maison air et Lumière. Schools and kindergartens are characterised by relatively few m² per person in classrooms and activity rooms, and by a predictable use of the rooms based on predefined schedules. Furthermore, schools and kindergartens are often public buildings with limited budgets, both for construction of new buildings and for renovation of existing buildings. There can be legislative requirements to minimum ventilation rates or maximum CO2 concentrations. To ensure a well-performing natural ventilation system for a classroom, the window opening area in relation to the number of students and the floor area are the key design parameters. As much opening area as possible should be achieved. Single-sided ventilation by facade windows alone can be challenging - much better performance is achieved in combination with roof windows. The performance can be verified by a simulation in VELUX Energy and Indoor Climate Visualizer, which determines CO2 concentrations. Hybrid ventilation can be a good solution in colder climates in order to reduce draughts and energy use (Steiger et al, 2012). VELUX roof windows perform well in schools. In larger rooms, VELUX Modular Skylights perform very well. Larger commercial buildings, like office buildings, typically have more complex requirements to control air quality than residential buildings. The internal loads (person density, computers and equipment) are higher than in residential buildings. The occupants spend much time at fixed locations (the desk or meeting rooms), and the dress code is more formal than in residential buildings. The ventilation rate is often determined by the cooling need rather than the need for fresh air supply for the occupants. There can be indoor air quality requirements from occupational health authorities that are not present in residential buildings. Office buildings can be designed with natural, mechanical or hybrid ventilation. If natural or hybrid ventilation is used, it will most often be automatically controlled, based on sensors, by a central (BMS) system that controls all services in the building. In office buildings it is important to ensure that facade windows do not occasionally (due to wind speed and direction) function as outlets. A typical design with natural or hybrid ventilation is a building with a large atrium in the centre, and offices, meeting rooms, etc. near the facades. Facade windows are designed as inlets, and the roof of the atrium is equipped with a large area of operable windows that function as extracts. VELUX Modular Skylights are designed for use in this type of buildings and perform well as extract openings in an atrium roof. Bekö, G., Toftum, J. and Clausen, G. (2011) Modeling ventilation rates in bedrooms based on building characteristics and occupant behavior. Building and Environment, 46(11), 2230–2237. Dhalluin, A.,Limam, K. (2012) Comparison of Natural and Hybrid Ventilation Strategies used in Classrooms in Terms of Indoor Environmental Quality, Comfort and Energy Savings. Indoor and Built Environment, 23(4), 527–542.doi:10.1177/1420326X12464077. Steiger, S., Roth, J. K., Østergaard, L. (2012) Hybrid ventilation - the ventilation concept in the future school buildings? In AIVC conference Copenhagen 2012. Wargocki, P., Alexandre, N., and Da, F. (2012) Use of CO2 feedback as a retrofit solution for improving air quality in naturally ventilated classrooms. In Proceedings of Healthy Buildings 2012.